Knight KSHEA Overhead Carriage Mounted and KSHAEA Floor Mounted Extension Servo Arms are Intelligent Assist Devices (IAD) that enable an operator to reach outside the area directly below a rail system and to precisely locate or float loads in the “Z” direction (vertical axis) with speed and reliability. The extension servo arms allow for a non-linear overhead varied reach within a work cell or station. 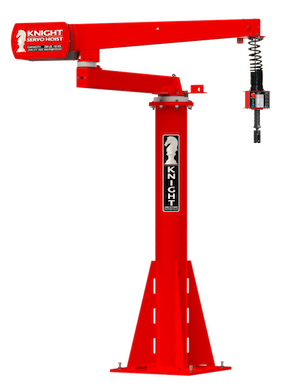 Knight’s Servo Hoist technology becomes an extension of an operator’s natural movements and greatly improves accuracy, responsiveness and repeatability; which increases overall safety, productivity and quality. The inherent benefits include: eliminating wasted motions, reduced reaction times, and minimal effects of inertia with heavy loads. Speeds: Up to 241 ft. per min. [60mpm]. Floor Mounted Pedestal Heights: 8 ft. [2.4m] – 10 ft. [3.0m]. Knight’s Patented Chain, for longer life. Chain Length, Unlimited (18 ft. Standard). H5 Rated (Continuous Duty Cycle). (1) EBA1393 Precision Gauge Included. Programming and Diagnostic Communication Ports. Industry Standard 24 VDC, 2 AMP power is available for custom tooling such as: Clamps, Vacuum Cups, Switches, Proximity Limits, Lights, etc. 240 VAC, Single Phase 50/60 Hz. Load Sensing, Pay Load and Handle Load. (8) Inputs/ (4) Outputs are free for interface controls. LED Status Indicators, Green and Blue Lighted Push buttons. LED Fault Indicators, Illuminated Run/ Stop Button, Twist to Release. When Selecting a Knight Servo Control System there are many factors to determine before selecting the appropriate configuration. To assist in determining the correct configuration for your application you will need to Print, Fill-out and Submit the configuration sheet below to Knight’s Estimating Department. If you need any assistance or need more information, Contact our Servo Department. System configuration – The KSHAEA Series comes as a complete system with the option of an inline handle or a remote handle. One or the other comes with the system, not both. Lifting Capacity – Include your fixture, and part weight when determining a size. 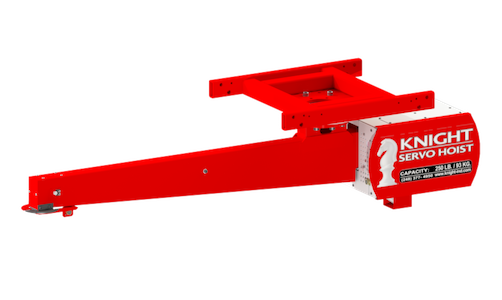 Rail height – Know your hang point, from the bottom of the rail to the load hang point on a servo can be as tall as 4 ft., depending on your system configuration. Determine your pick-up and drop-off heights, this is very important and can affect your stack-up and rail height. Use the application drawing to determine your stack up. Trolley – determine your hang point (this can not be a single point) and choose your trolley. If you have a trolley already, an EBD1127 adaptor plate will be provided at no extra charge. Hoist Control Set-up – Determine how your going to control your up/ down movement, and which configuration best fits the application; keeping the following in mind. Can the operator reach the handle in the upmost position? Will the operator be safe using the inline handle with being so close to the load? Can the operator always reach the run-stop button? Be sure you identify the any additional cables when choosing your configuration. Plant Power – Servo systems operate on 230VAC 1phase. If the plant that this is being installed in only has 480VAC, you will need to order one of our 480VAC/ 240VAC transformer disconnect options. Knight’s Inside Sales Team, Estimating Departments, and Phone Support Team are available Monday – Friday (8am to 5pm) Eastern Standard Time to help assist you. Our Sales Associates and Global Support Organization will work in unison with you and our Product and Design Specialists to take care of all your ergonomic material handling needs.